Espresso Events Presents: Acoustic Sessions @ CS! 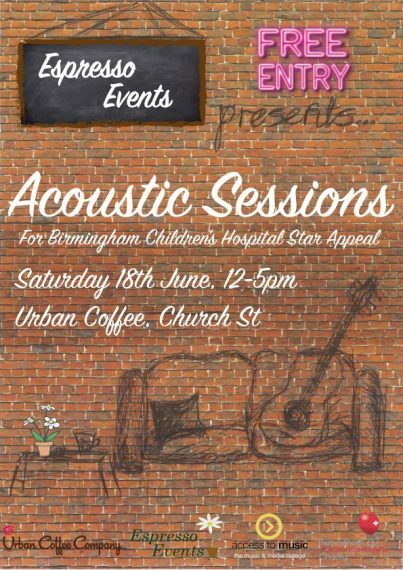 Our Church Street emporium is very excited to host a live music session by Espresso Events, to raise money for Birmingham Children’s Hospital. “Espresso events is two music business students that believe in bringing live acoustic music performances from local talents to local, quality independent coffee shops. Our business is not-for-profit, we will be collecting donations for the Birmingham Children’s Hospital’s Star Appeal, which is funding the UK’s first rare diseases unit. The event is on Saturday 18th June and runs from 12-5pm. See you there!